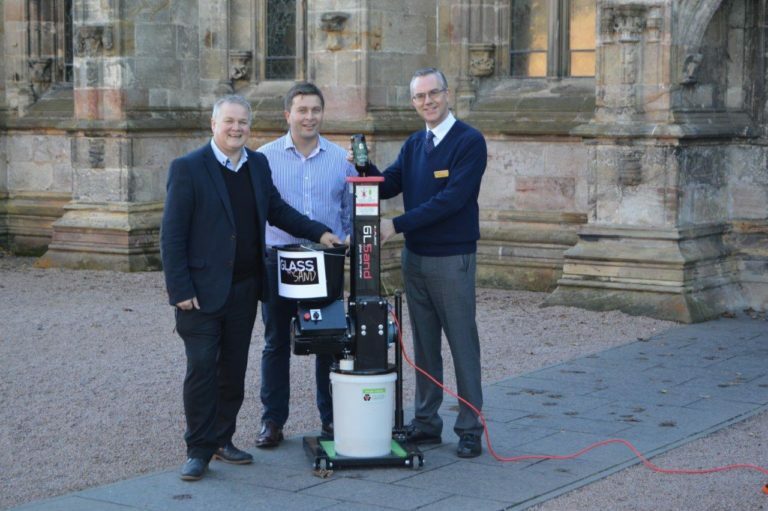 Rosslyn Chapel’s work to promote its environmental sustainability has been boosted this week after taking the first delivery of sand, created by recycling glass, from bottles used in its coffee shop. Like many churches, the 15th-century Chapel has a votive candle stand, where visitors can light a candle during their visit, and the stand has a layer of sand to catch any dripping wax. Sand, made by recycling glass bottles used in the Chapel’s coffee shop is now being used there, thanks to an innovative idea from the Chapel’s catering partner, Saltire Hospitality. Rosslyn Chapel is open to visitors all year round. Saltire Hospitality, also based in Midlothian, has been the Chapel’s catering partner since 2013, running its daytime coffee shop and providing catering for evening visits.